When choosing a homeschool grammar curriculum, I have two objectives. I try to choose a grammar curriculum that will teach my children what they need to know. I try to choose a grammar curriculum that will teach grammar as painlessly as possible. Which Homeschool Grammar Curriculum Did We Choose? For my oldest child I used English for the Thoughtful Child which was recommended by Susan Wise Bauer. For homeschooling families, there weren’t as many choices available as there are now. When my children became a little older, I moved them into time First Language Lessons by Jessie Wise. But those children of mine were growing faster than Dr. Bauer and Mrs. Wise could publish resources. So I started looking for a new homeschool grammar curriculum. Eventually, I came across a program called Winning with Grammar. My daughter liked it and did well with it, but my son didn’t thrive for some reason. Something just didn’t click with him. For that reason, we moved on to Analytical Grammar. That was also great, but my son wasn’t really old enough for it. My daughter did extremely well with it, however. After we finished Analytical Grammar, we joined a co-op, and I was able to select a grammar book for the students in my writing class. I decided to go with A Beka Grammar 9th grade text, which, surprisingly, can be sued as a homeschool grammar curriculum or traditional classroom grammar curriculum. My oldest son went from studying grammar via Latin to studying grammar via Latin and Easy Grammar as part of his language arts. For my younger two, I am using a book I came across called Sheldon’s Primary Language Lessons. I like it so much that I have republished the book as a workbook to make it more Charlotte Mason friendly and open and go for me and my children. For anyone interested in the original version, it can be found free online. The original is more involved than what I have, but not nearly as user friendly. Even so, I highly, highly recommend it. For my younger boys, Sheldon’s New Primary Language Lessons, combined with The Schoolhouse Rock videos is giving my younger two a better grammar foundation than what my older children received. This year I have my fifth grader finishing up Sheldon’s New Primary Language Lessons; we take it slow. My 7th grammar is starting a new grammar book I created. 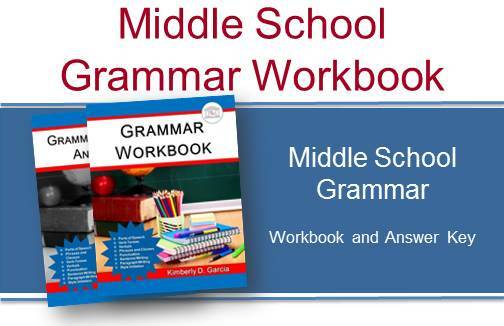 The Grammar Workbook. I made it because I wanted to incorporate more writing, allow my sun to see the grammar in action. My 10th grader will probably be working through Abeka Grammar, as did my daughter, or something similar. My 12th grader is for now finished with grammar, but will study it in context as she writes a novel this school year for her senior project. Writing a novel (she wants to be a writer) will require her to do an extensive amount of self-editing. She’ll have to look up concepts as she needs them–an excellent way to study grammar.